Last year, President Donald Trump pardoned Alice Marie Johnson, a Tennessee woman who spent 21 years in prison after being convicted of a non-violent drug offence in 1996. 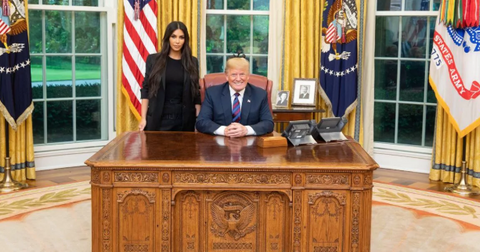 The idea to pardon Johnson came from a surprising place — Kim Kardashian West. Kardashian West read about her case in 2017 and took up her cause, eventually travelling to the White House to plead her case. And now, she's hoping to continue that win streak by starting a four-year apprenticeship at a law office based in San Francisco last year so that she can take the bar in 2022. Yes, Kim Kardashian West wants to become a lawyer according to a profile published in Vogue this week. "It's never one person who gets things done; it's always a collective of people, and I've always known my role, but I just felt like I wanted to be able to fight for people who have paid their dues to society. I just felt like the system could be so different, and I wanted to fight to fix it, and if I knew more, I could do more," she told Vogue. The profession runs in the family, with Kardashian West's father, Robert Kardashian, being a member of OJ Simpson's defense team. Kardashian West says that she was inspired by her father, and would spend hours looking at his legal books as a child. She said she was convinced to peruse her current goals while working with CNN commentator Van Jones and several lawyers to lobby for clemency for Johnson. Jones and attorney Jessica Jackson are co-founders of #cut50, which advocates for criminal justice reform. Kardashian is working on her studies through the organization. Kardashian West says that she works with the group 18 hours a week. The advocacy group told INSIDER that Kardashian West is doing her apprenticeship through the group and under the supervision of Jackson. In California, those who have apprenticed with a law office or sitting judge can tale the bar exam without going to law school. It's actually very uncommon and probably the least used path to passing the bar, but it's a legitimate way to get there. In fact -- Abraham Lincoln actually took the same path to become a certified lawyer. Jones went on to say that Kardashian West's help was vital in securing the release of Johnson. "I watched with my own eyes Trump confess to having tremendous fears of letting somebody out of prison and that person going and doing something terrible, and the impact that that would have on his political prospects. He was visibly nervous about it. And I watched Kim Kardashian unleash the most effective, emotionally intelligent intervention that I've ever seen in American politics," he said. Unsurprisingly, people had mixed opinions on the sudden career change. Many pointed out that others wouldn't have a similar opportunity. Y’all: SHE HAS NO SKILL. TRASH. Kim Kardashian is studying to become a lawyer? Wow honestly didn't expect that, but given who her father was and her slight interest in prison reform, it's not too surprising. If she's serious about this then s/o to her I can fw that. Kim Kardashian is in the process of passing the California Bar, focusing on criminal law. Good for her. Criminal defence is a noble profession.